I have been wanting for weeks to write to the little widowed4 Margaret5, but for the last month life has been very crowded. Edith6 and I went down to a mild part of Virginia7 because I could not seem to check my bronchitis here. 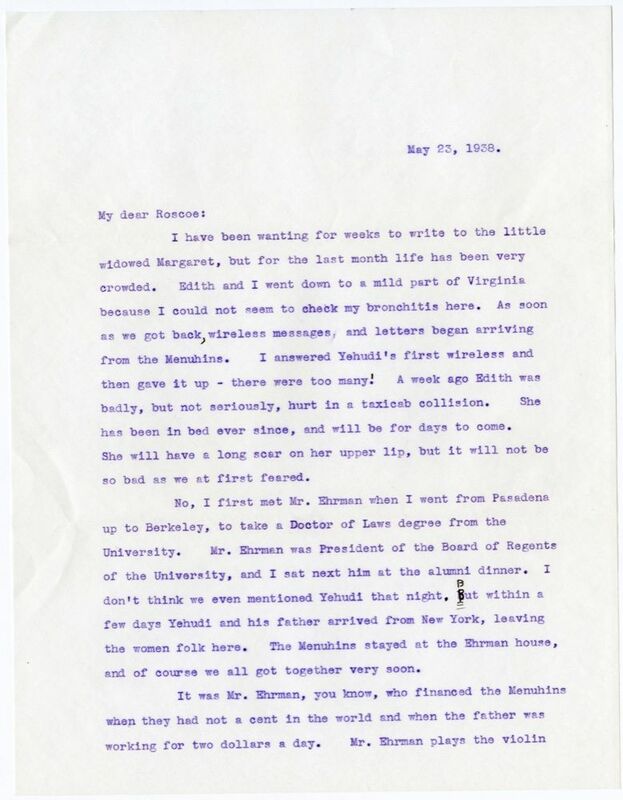 As soon as we got back, wireless messages and letters began arriving from the Menuhins. I answered Yehudi's8 first wireless and then gave it up – there were too many.! A week ago Edith was badly, but not seriously, hurt in a taxicab collision. She has been in bed ever since, and will be for days to come. She will have a long scar on her upper lip, but it will not be so bad as we first feared. No, I first met Mr. Ehrman9 when I went from Pasadena10 up to Berkeley11, to take a Doctor of Laws degree from the University12. Mr. Ehrman was President of the Board of Regents of the University, and I sat next him at the alumni dinner. I don't think we even mentioned Yehudi that night,. bBBut within a few days Yehudi and his father13 arrived from New York2, leaving the women folk14 here. The Menuhins stayed at the Ehrman house, and of course we all got together very soon. It was Mr. Ehrman, you know, who financed the Menuhins when they had not a cent in the world and when the father was working for two dollars a day. Mr. Ehrman plays the violin himself, is very musical, and had a sound musical education. When Yehudi was six years old Mr. Ehrman resolved to back him. 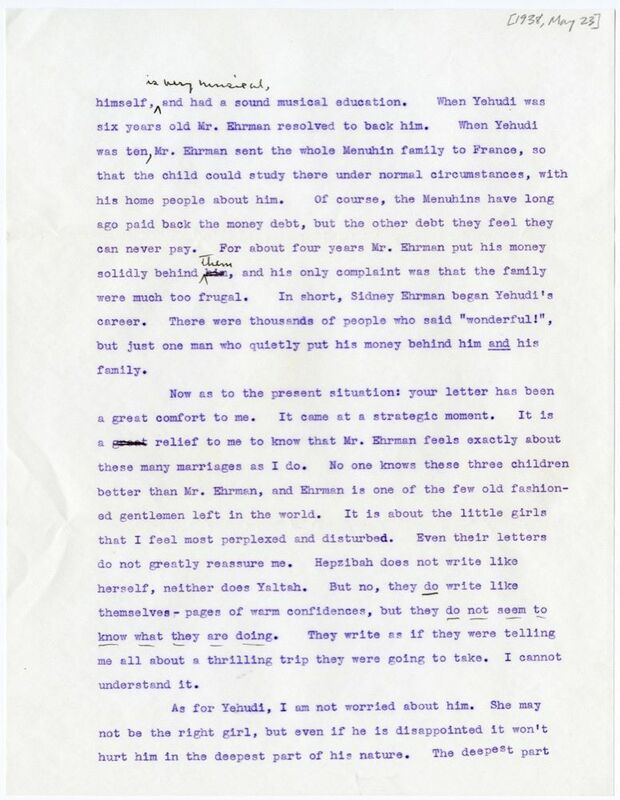 When Yehudi was ten, Mr. Ehrman sent the whole Menuhin family to France15, so that the child could study there under normal circumstances, with his home people about him. Of course, the Menuhins have long ago paid back the money debt, but the other debt they feel they can never pay. For about four years Mr. Ehrman put his money solidly behind him them, and his only complaint was that the family were much too frugal. In short, Sidney Ehrman began Yehudi's career. There were thousands of people who said "wonderful! ", but just one man who quietly put his money behind him and his family. Now as to the present situation: your letter has been a great comfort to me. It came at a strategic moment. It is a great relief to me to know that Mr. Ehrman feels exactly about these many marriages16 as I do. No one knows these three children better than Mr. Ehrman, and Ehrman is one of the few old fashioned gentlemen left in the world. It is about the little girls that I feel most perplexed and disturbed. Even their letters do not greatly reassure me. Hepzibah17 does not write like herself, neither does Yaltah18. But no, they do write like themselves – pages of warm confidences, but they do not seem to know what they are doing. They write as if they were telling me all about a thrilling trip they were going to take. I cannot understand it. As for Yehudi, I am not worried about him. She19 may not be the right girl, but even if he is disappointed it won't hurt him in the deepest part of his nature. The deepest part of his nature simply is music, has been from his infancy. Yet, if he were to lose his right hand, I am quite sure it would not ruin his life. Nearly all the great music of the world he knows by heart and carries in his mind and consciousness. It flows through his mind just as a scene from one of the great Shakespearian plays often flows through mine, line by line, and it is just as satisfying to me as if I said it aloud. But inwith music this process is much more complex and gratifying. Furthermore, Yehudi is a very deep thinker, though he is very modest and very seldom talks to people about anything serious. I had known him for three years before we organized our Shakespeare20 Club21, and not until then did I know anything about what laidlay beneath in this boy of gentle voice and charming manners. All these reflections, my dear, are of course very confidential – strictly for you and Margaret and Meta23. Next to the Lindberghs24, the Menuhins are the "best news" in the world, and I scarcely dare whisper any fact or opinion about them for fear of seeing myself quoted in the New York Times25 next morning. Tell dear Margaret I shall write her a very special letter soon. aAnd ask her, please, not to get married right away. I want to take a trip with her first. I seem to be losing all my young companions at once! Document is three leaves, typewritten on recto of each leaf only. Includes one envelope, typewritten with handwritten correction. 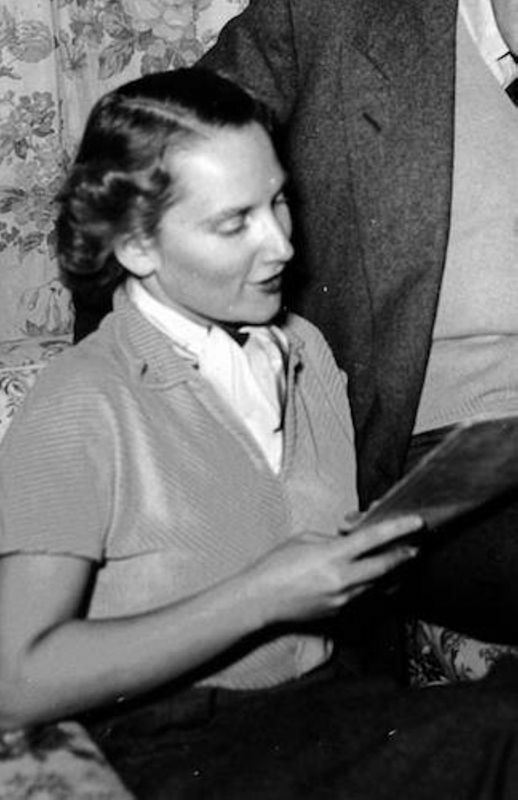 Margaret's twin sister Elizabeth was married to Lynn S. Ickis in April 1938. Willa Cather received an honorary degree from the University of California in Berkeley on 23 March 1931 at the university's Charter Day ceremony. Yehudi, Hepzibah, and Yaltah Menuhin married, respectively, Nola Nicholas, Lindsay Nicholas, and William Stix in 1938. 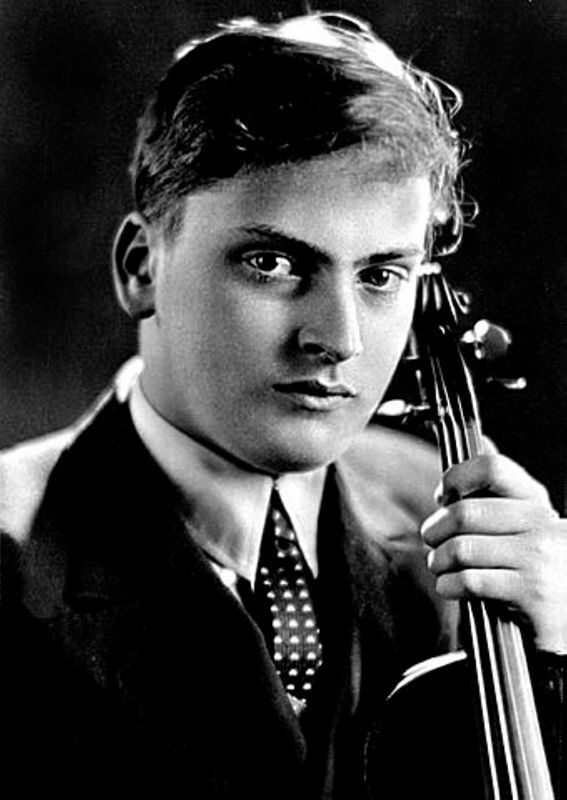 In his autobiography, Yehudi Menuhin writes: "In our apartment there was a little room, nobody's property in particular, small enough to be cozy, and furnished with a table around which Aunt Willa, Hephzibah, Yaltah, myself and often Aunt Willa's companion, Edith Lewis, gathered for Shakespearean reading, each taking several parts, and Aunt Willa commenting on the language and situations in such a way as to draw us into her own pleasure and excitement" (Unfinished Journey, 130). Ehrman, Sidney Myer (1873-1975). American attorney and philanthropist. 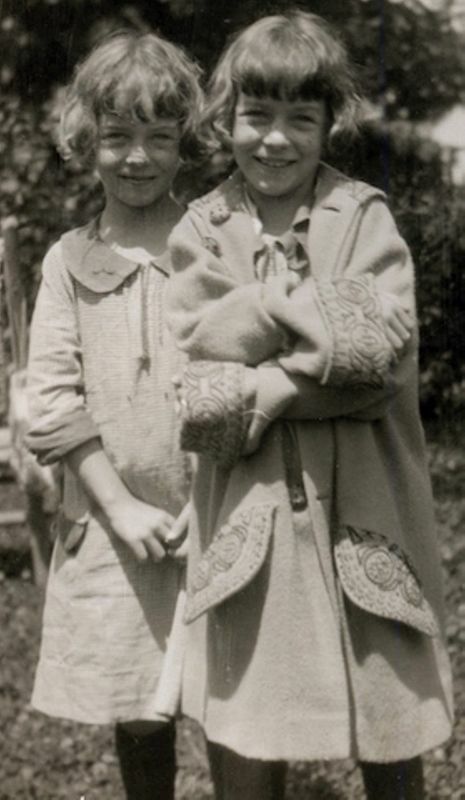 Born in the California, Sidney Ehrman married Florence Hellman, daughter of one of the most important business lawyers in California, in 1904; they had two children, Sidney H. Ehrman and Esther H. Ehrman. Sidney Ehrman met the Menuhin family in San Francisco in the early twentieth century and funded Yehudi Menuhin’s studies in New York and in Paris in 1925 and 1926 and bought his first full-size concert violin, a 1695 Grancino. 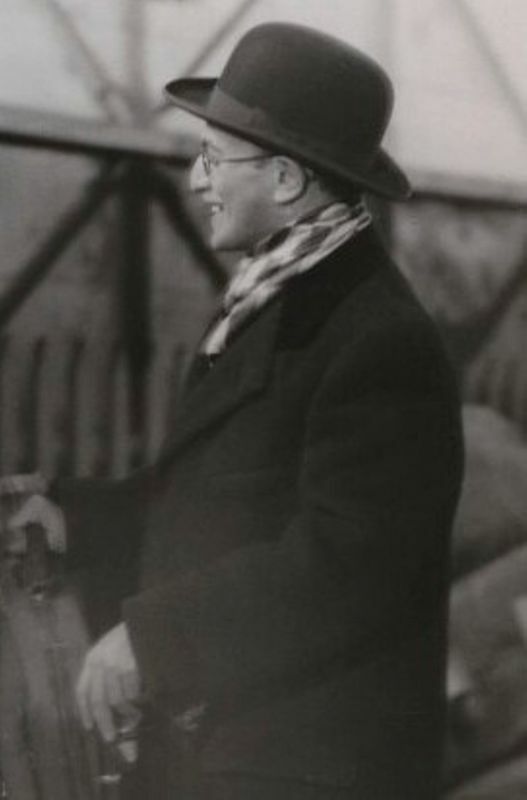 Sidney Ehrman, appointed a regent of the University of California in 1930, met Cather when she received an honorary doctorate from the university in 1931. Shakespeare, William (1564-1616). English playwright, actor, and poet. Shakespeare is widely regarded as the greatest playwright of the English language. While not much is known definitively about his life, he was a member of Lord Chamberlain’s Men, a company of theatrical players, beginning in 1594 (the group later changed their name to the King’s Men). From 1590 to 1613, he wrote thirty-seven plays that continue to be widely performed. 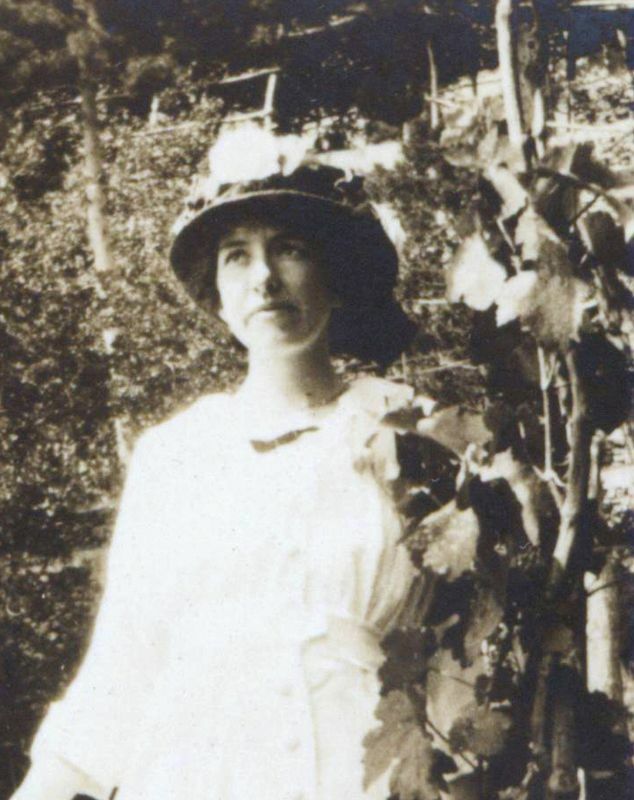 Cather’s lifelong love for Shakespeare’s work began in childhood as the Cather family had several volumes of Shakespeare in their book collection. 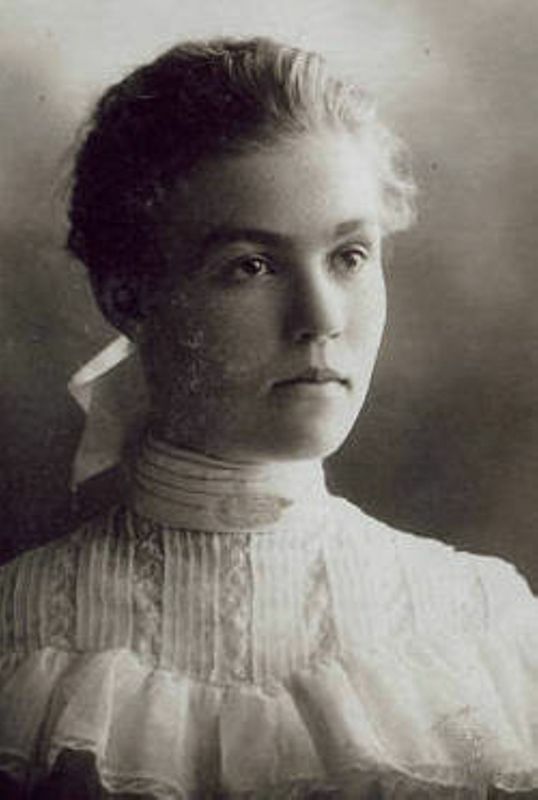 While at the University of Nebraska, she took four semesters of Shakespeare and in 1891 published a two-part essay, “Shakespeare and Hamlet” in the Nebraska State Journal. Her fiction is filled with allusions to Shakespeare. 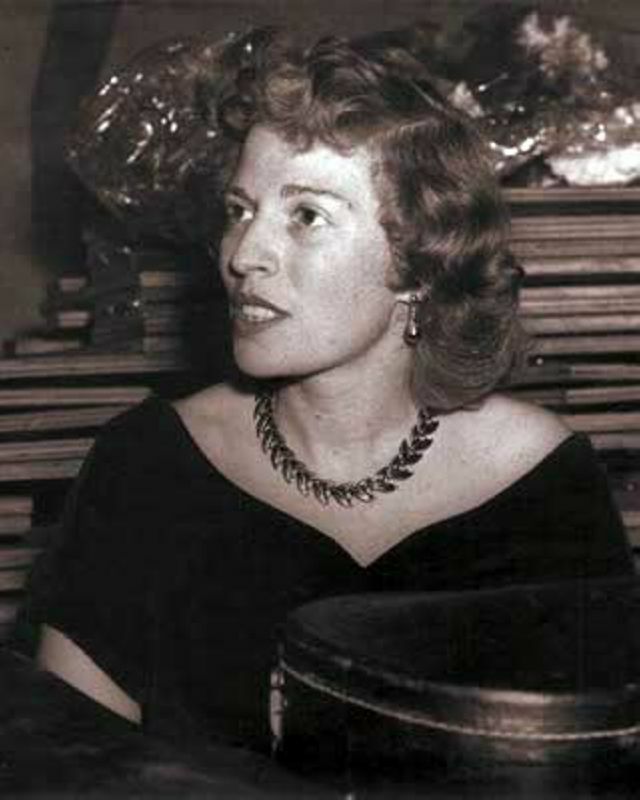 In her later years, she formed an informal Shakespeare book club with the child prodigies Yehudi, Hepzibah, and Yaltah Menuhin and spent the last winter of her life reading his works. Lindbergh, Anne Morrow (1906-2001). American author and aviator. 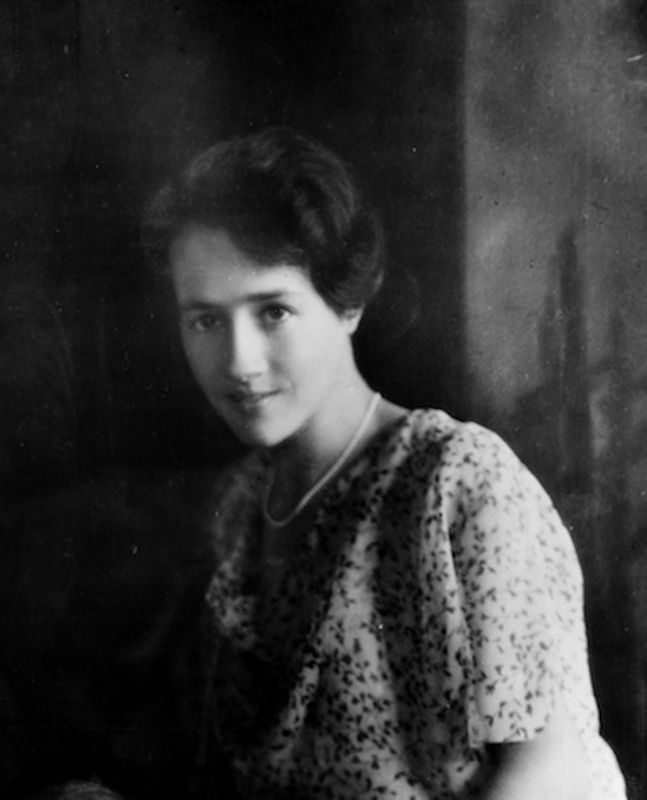 Born in Englewood, NJ, to Dwight Morrow and Elizabeth Cutter Morrow, Anne Morrow graduated from Smith College in 1928 with a degree in English. She married aviator Charles Lindbergh in 1929 and became his copilot. Cather met the Lindberghs in 1931, when both she and Charles Lindbergh were given honorary degrees by Princeton University. On March 1, 1932, the Lindberghs first child, Charles Jr., was kidnapped; the crime and the discovery of the boy’s body ten weeks later were a media sensation. Cather admired Anne Lindbergh’s first book, North to the Orient (1935), which recounted her 1931 journey with Charles to Asia via the great circle route in 1931. 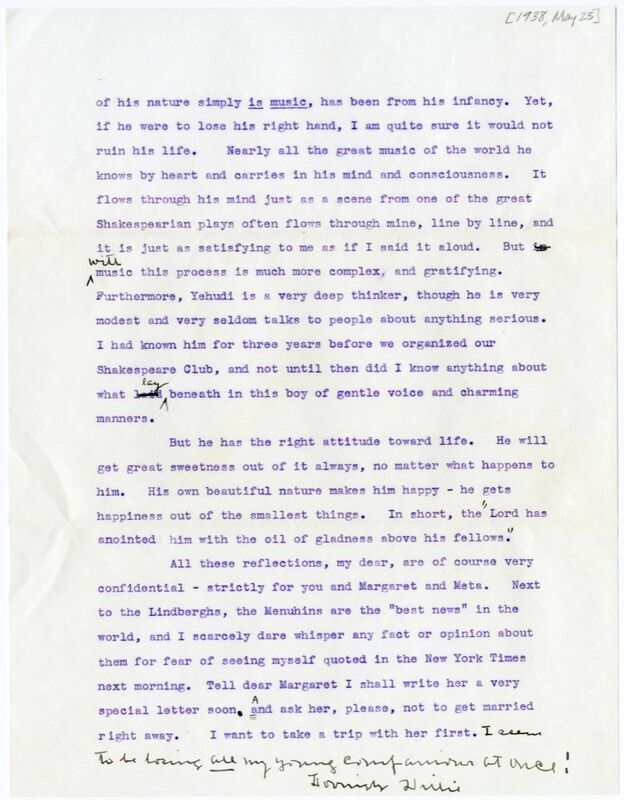 Lindbergh’s best-known book is Gift from the Sea (1955), an inspirational meditation on modern life and particularly the challenges facing women, which has sold more than three million copies. 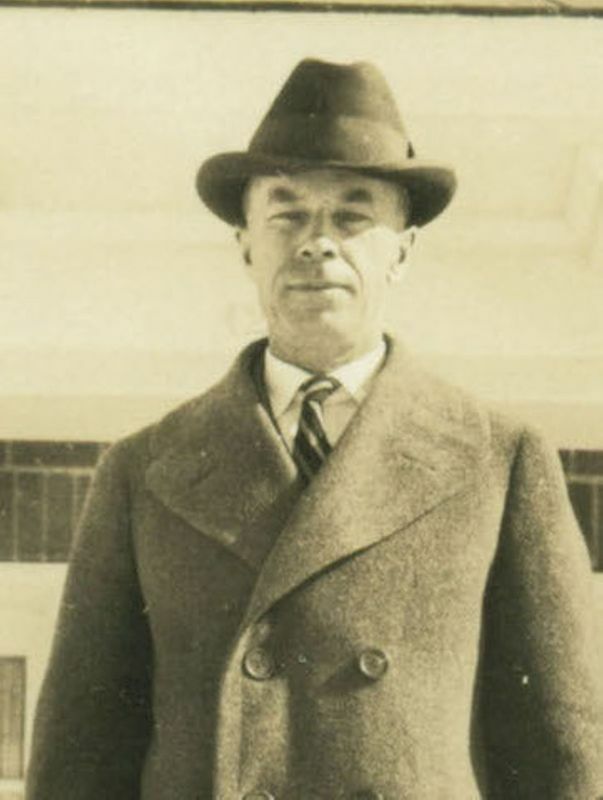 Lindbergh, Charles Augustus (1902-1974). American aviator. 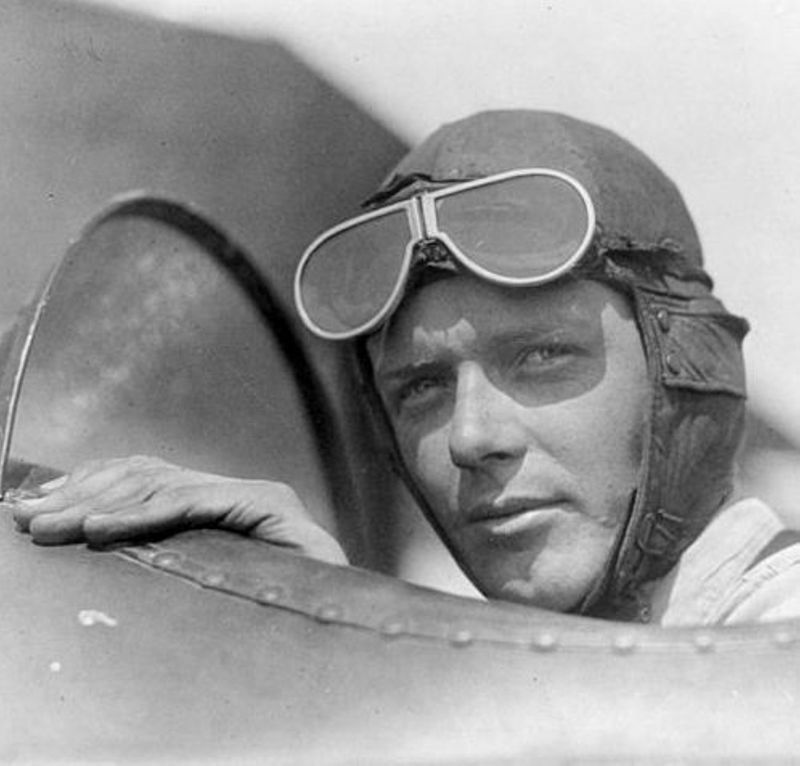 Born in Detroit, MI, to parents of Swedish descent and raised in Minnesota, Charles Lindbergh wanted to become a flyer in World War I but was too young. After three semesters studying engineering at the University of Wisconsin, he left to become a barnstorming pilot and later enlisted in the Army Air Service and became a captain in the Missouri National Guard. Lindbergh’s 1927 nonstop flight from New York to Paris piloting the Spirit of St. Louis made him an international celebrity. In 1929 he married Anne Cutter Morrow, who became his copilot. Cather met the Lindberghs in 1931, when both she and Charles Lindbergh were given honorary degrees by Princeton University. On March 1, 1932, the Lindberghs first child, Charles Jr., was kidnapped; the crime and the discovery of the boy’s body ten weeks later were a media sensation. In 1939 Charles Lindbergh advocated against American involvement in World War II, and although he eventually supported the war, his non-interventionist stance tarnished his reputation. His bestselling book about his pioneering flight, The Spirit of St. Louis (1953), was awarded a Pulitzer Prize. Lindbergh, Charles A., III. (1930-1932). Son of Charles and Anne Lindergh. 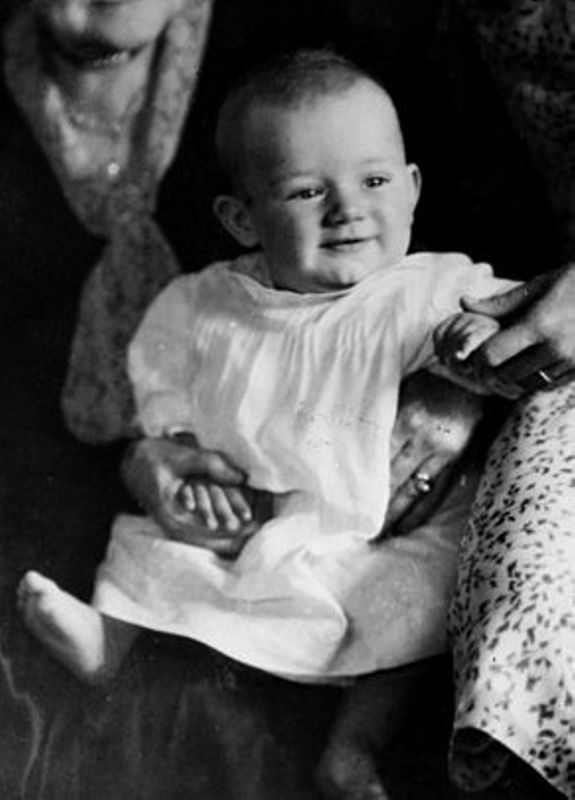 The first child of Charles Lindbergh and Anne Morrow Lindbergh was kidnapped on March 1, 1932. His body was discovered ten weeks later. Bruno Hauptman was tried and convicted of the kidnapping in 1934 and executed in 1935.